Careers in radiologic technology are on the rise across the country. With continued population growth and the aging of the Baby Boomer generation, jobs in all areas of health care are rising. Hospitals, medical centers, and nursing homes need more and more people to fill their positions. Rad Techs, who work with imaging, diagnostics, and other types of medical procedures are seeing a rise in jobs of 12 percent over the next decade. Now is the time to earn a degree in this field and to get a position working as a qualified professional. The approximately 4,260 people working in Wisconsin as radtechs earn on average $58,010 per year, but can earn upwards of $75,000 with experience and with areas of specialization. The average hourly wage in the state is $27.89 and can go as high as $37. Wisconsin is nearly on target with the average salary for radiologic technologists across the country. The mean annual salary in the U.S. is $60,320 and the mean hourly wage is $29. More information on Rad Tech salaries in Wisconsin. Most states require some type of licensing to work in this field. Wisconsin is the same, as the State of Wisconsin Department of Safety and Professional Services requires that anyone performing radiography or operating an X-ray machine or equipment needs a license or permit. To work in radiography or radiation therapy requires passing the exam set by the American Registry of Radiologic Technologists (ARRT). Those who want to work in this field must also meet any requirements listed by the ARRT. This includes earning a certificate or degree in an appropriate program. Typically the program includes a minimum of 24 credit hours of coursework. Wisconsin is a big state with many colleges and universities. For students interested in earning a degree or certificate in radiologic technology, there are many choices. University of Wisconsin, Milwaukee. The University of Wisconsin Hospital includes a School of Radiologic Technology. Students can earn a two-year degree here and be prepared for a career in the field. Concordia University, Mequon. This campus of Concordia has a four-year radiologic technology program that includes two years of course work and two years of clinical experience, resulting in a bachelor’s degree. Marian University, Fond du Lac. Marian’s program in radiologic technology involves two years of academic study on campus in Fond du Lac and two years of clinical work to achieve a bachelor’s degree. University of Wisconsin, La Crosse. The La Crosse campus of UW offers the state’s only bachelor degree program for radiation therapy. Graduates are prepared to work in cancer treatment. In addition to the four-year institutions, Wisconsin is home to many technical and community colleges that offer programs in radiologic technology. Madison Area Technical College, Madison. Students here can earn an associate of applied science degree in radiography over the course of two years. Blackhawk Technical College. Blackhawk, which has several campuses in the state, has a two-year radiography degree program that prepares students to take the ARRT exam and to get a job. Northcentral Technical College, Wausau. The two-year radiography program at Northcentral prepares students to find a career in radiography. Milwaukee Area Technical College, Milwaukee. Students at this school can work towards an associate of applied science degree in radiography. Northeast Wisconsin Technical College, Green Bay. Students in Green Bay can attend Northeast to earn an associate degree in radiography. Wisconsin is a populous state with several centers that are home to large medical centers and hospitals. Graduates with a degree in radiologic technology should have no problem finding a job here. The American Society of Radiologic Technologists is the leading professional organization in the U.S. for those who work as radiologic technologists. Workers in Wisconsin can also join the state affiliate, the Wisconsin Society of Radiologic Technologists. The organization that sets many of the standards for education in radiologic technology and the examination for licensing and certification is the American Registry of Radiologic Technologists. 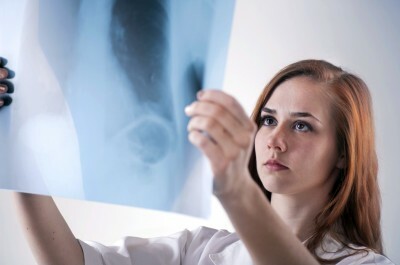 A good source of additional information about careers and programs in this field is the Joint Review Committee on Education in Radiologic Technology.